So I got this idea from Glamour - a reader random questionnaire. 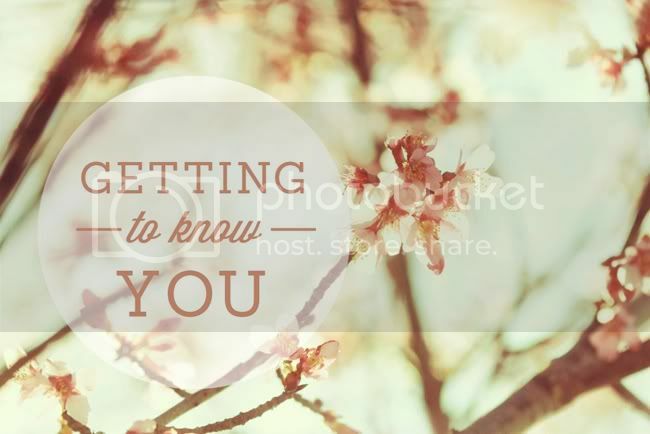 I'd love to "get you know you" guys a little more, simply fill out the questions and leave them in the comment box. It'll be so nice to see who reads this blog and possibly even find some new blogs! If you have a blog - I'll be sure to visit & leave a comment at your blog as well, letting you know I stopped by :) Thanks for reading everyone, hope you are enjoying reader appreciation week. and as a bonus to this post - the beautiful image used above is available for a free download! Click here to download the print. Print it out, set it as a desktop background - it's gorgeous! Courtesy of Dawn Smith Designs, thank you Dawn! TEA OR COFFEE: Tea - hot only, not iced. TIME I WOKE UP TODAY: 9:00. eek, I've been so tired lately.. TEA OR COFFEE: neither-- juice! MY DREAM VACATION WOULD BE: a Mediterranean cruise!! TEA OR COFFEE: Tea. Specifically sweet tea served cold. FAVORITE GUILTY PLEASURE TV SHOW: I don't really feel guilty about any shows I watch. I guess maybe Project Runway? TEA OR COFFEE: Neither - hot chocolate all the way! TEA OR COFFEE: Tea! Coffee makes my stomach hurt. FAVORITE GUILTY PLEASURE TV SHOW: I actually don't own a TV, but I watched The Sing-Off religiously on Hulu when it was on! MY DREAM VACATION WOULD BE: I think some crazy amazing hotel on a secluded island in the south Pacific. Something that opened onto its own private beach with no one else in sight. TEA OR COFFEE: tea, tea and more tea! FAVORITE GUILTY PLEASURE TV SHOW: Guilty pleasure? Ha, boy do I have a good one! I really love 90s kids shows, so how about Blues Clues (with Steve). I don't know why I like it, but I totally do. TEA OR COFFEE: Coffee! Black. TIME I WOKE UP TODAY: 6:11am Ugh. FAVORITE GUILTY PLEASURE TV SHOW: Gilmore Girls! MY DREAM VACATION WOULD BE: Backpacking around Europe & India with my love. TEA OR COFFEE: Hot Chocolate!! FAVORITE GUILTY PLEASURE TV SHOW: Once Upon A Time! time i woke up today: 8:30. it's my last finals week and today is a day off, thankfully. my dream vacation: maybe back to the French Riviera again. or Greece! definitely Greece. Tea or coffee: Tea, I drink liters a day. My dream vacation would be: Another trip to India, there is so much more to see than the places I have visited. TIME I WOKE UP TODAY: 8:00 a.m. FAVORITE GUILTY PLEASURE TV SHOW: Any and all Real Housewives. MY DREAM VACATION WOULD BE: At this moment, driving from London to Scotland and touring around with my husby. FAVORITE GUILTY PLEASURE TV SHOW: HDTV, new addiction. MY DREAM VACATION WOULD BE: African Safari or Thailand trip! TEA OR COFFEE: depends on the mood. Tea when reading, coffee when working. TIME I WOKE UP TODAY: 11:45AM, 30 min. late for work! FAVORITE GUILTY PLEASURE TV SHOW: 90210. Everyone seems to get with everyone in that group! MY DREAM VACATION WOULD BE: A road trip to Colorado or down Route 66. I would love to go to Yosemite or the Grand Canyon - anywhere really scenic, and watch the sunset with a killer road trip soundtrack playing in the car. TEA OR COFFEE: chai tea occasionally, coffee never. TIME I WOKE UP TODAY: 8:15 a.m. FAVORITE GUILTY PLEASURE TV SHOW: Pretty much anything on Bravo. MY DREAM VACATION WOULD BE: anywhere with a mixture of sun, beach, water. TEA OR COFFEE: Coffee in the morning, tea in the evening. FAVORITE GUILTY PLEASURE TV SHOW: Anything on ABC Family! MY DREAM VACATION WOULD BE: A desert island with a sweet house! MY DREAM VACATION WOULD BE: I think that more than a vacation, I'd like to live abroad somewhere for a year or two. Like teaching English in an Asian country, for example, and from there travel to Japan, China, New Zealand, Thailand, South Korea, India, Australia, etc, all from the country I'd be teaching at. I'd be poor, but happy. This is such a cute idea Danni! TEA OR COFFEE: Chai tea which I make myself each morning. I can probably count the # of cups of coffee I've had in my life on one hand. TIME I WOKE UP TODAY: 8:30. The cold weather keeps me snuggled up under covers. FAVORITE GUILTY PLEASURE TV SHOW: House Hunters International. I live vicariously through all the people who have moved abroad. MY DREAM VACATION WOULD BE: Traveling Europe with my brother. He has never been and I just desperately want to go back. TEA OR COFFEE: Vanilla chai tea! TIME I WOKE UP TODAY: 7:30, for work. FAVORITE GUILTY PLEASURE TV SHOW: Jerseylicious. Blah I am ashamed that I just typed that. MY DREAM VACATION WOULD BE: Italy and Greece. AH so dreamy. Also, giveaway on my blog! TEA OR COFFEE: coffee, always hot, always black. FAVORITE GUILTY PLEASURE TV SHOW: King of the Hill, I swear that show has superb character development ... and it's hilarious. TEA OR COFFEE: tea, all the way! MY DREAM VACATION WOULD BE: Italy! MY DREAM VACATION WOULD BE: Patagonia.. or expeditions starting in Istabul, Turkey traveling south through the country towards Lebanon, Israel, Jordan and Egypt. Tea or Coffee: Coffee. I try to drink tea, I would like to drink tea... But I just can't drink tea. Favorite Guilty Pleasure TV Show: Hart of Dixie ... It's so awful, but so good. My Dream Vacation Would Be: This is a hard one. I want to go everywhere. Right now, I'd really like to go to Ireland or India or Thailand or all three. Or how about everywhere? I mean, it's my dream vacation, right? Okay. Everywhere. TIME I WOKE UP TODAY: Eep, 10ish! haha. MY DREAM VACATION WOULD BE: A European vacation with my boyfriend, family, my dog & a few of my closest friends! With a stop in Australia & New Zealand! & then a tour of Hawaii and the West Coast on the way home! ;) Haha. TEA OR COFFEE: BOTH - depends on the time of day! FAVORITE GUILTY PLEASURE TV SHOW: The BACHELOR! TEA OR COFFEE: Coffee almost always. Tea only since i've been detoxing this week though. TEA OR COFFEE: dr. pepper. is that an option? FAVORITE GUILTY PLEASURE TV SHOW: The O.C. - it isn't on anymore but I could watch reruns for hours! Oh Seth Cohen. MY DREAM VACATION WOULD BE: Beaches in Austrailia, Italy & France and then hop on over to Greece & Israel. Can that be one trip? TEA OR COFFEE: Tea - hot in winter, iced in summer! MY DREAM VACATION WOULD BE: Bashing around the Scottish countryside with a well-lined purse! FAVORITE GUILTY PLEASURE TV SHOW: currently... Once Upon a Time & Smash! TEA OR COFFEE: coffee every morning. b/c i've been extra sleepy lately! TIME I WOKE UP TODAY: 8:10 AM. way too late :( i'm starting to look like a hot mess at work every day. TEA OR COFFEE: coffee in the morning, tea in the evening. I love both! TEA OR COFFEE: It's a close call, but I'd say coffee right now. I prefer both iced. MY DREAM VACATION WOULD BE: Somewhere warm with the beach, a forest, and no need to leave anytime soon. MY DREAM VACATION WOULD BE: Exploring Japan! TEA OR COFFEE: Tea. Strongly dislike coffee. Is chocolate milk a choice? TIME I WOKE UP TODAY: 7am. hubby takes morning baby duty. love him. FAVORITE GUILTY PLEASURE TV SHOW: oh lord. Ghost anything. Adventures, Hunters, International. but i'm also a reality game show addict. MY DREAM VACATION WOULD BE: Japan. or a trip back to Ushuaia and South South America to show my husband the places we couldn't see together. i'm going to do this on my blog today too! i know i have lurkers that i'd love to get to know and follow back! TEA OR COFFEE: Coffee, definitely. I'm quite the addict. FAVORITE GUILTY PLEASURE TV SHOW: X-Factor, American Idol, Got Talent. PS: I adore your blog, Danni! You're such an inspiration. I stumbled upon your blog during one of my lowest moments, I know God brought me here :) Keep doing what you do, take care! MY DREAM VACATION WOULD BE: Backpacking through Europe! TEA OR COFFEE: Coffee, hot or blended, just not iced. MY DREAM VACATION WOULD BE: To go to Brazil during the World Cup in 2014. TEA OR COFFEE: I love both, but my stomach only loves tea. MY DREAM VACATION WOULD BE: Japan, and/or Greece/Turkey. Anywhere with friendly people, lots of culture, and great food. FAVORITE GUILTY PLEASURE TV SHOW: a whole bunch of them)) "Pretty Little Liars", "Make It Or Break It", "Gossip Girl", etc. TEA OR COFFEE: Neither, I mostly drink water. FAVORITE GUILTY PLEASURE TV SHOW: Too many to count, but I love ABC family shows, especially Pretty Little Liars. MY DREAM VACATION WOULE BE: Going back to London/Paris and exploring more. TIME I WOKE UP TODAY: 5am. Gym, you kill me. FAVORITE GUILTY PLEASURE TV SHOW: Ace of cakes. Looove it! TEA OR COFFEE:Coffee, I didn't choose it, it chose me! FAVORITE GUILTY PLEASURE TV SHOW: Anything on Bravo. MY DREAM VACATION WOULD BE: A trip to Europe. MY DREAM VACATION WOULD BE: Anywhere hot!! TEA OR COFFEE: hot tea only! FAVORITE GUILTY PLEASURE TV SHOW: I don't really watch TV anymore. Maybe MadMen? MY DREAM VACATION WOULD BE: I really just would like to go back to summer camp for a week. MY DREAM VACATION WOULD BE: Hike the old highway in Japan and visit the towns you can only reach by foot! TEA OR COFFEE: Iced chai or mocha frappes. FAVORITE GUILTY PLEASURE TV SHOW: Deadliest Catch, Breaking Bad, Nurse Jackie. just wanted to say i adore your blog - such a sweet little place for inspiration :) my sister is leaving for rome this weekend and i've used your message in a bottle idea - can't wait for her to open them every week! thank you! FAVORITE GUILTY PLEASURE TV SHOW: Doesn't make me feel guilty, but: "Grey's Anatomy"
MY DREAM VACATION WOULD BE: Melbourne, again. I love that city. Or even better: Travelling the world for three or six months. TIME I WOKE UP TODAY: 5:45am...eeek! MY DREAM VACATION WOULD BE: Island and beach hoping in southern Europe! TIME I WOKE UP TODAY: 7:45- I'm a morning person! MY DREAM VACATION WOULD BE: A camping roadtrip across the US, starting in Oregon and making my way to the other coast. MY DREAM VACATION WOULD BE: Greece or Paris. Love both! TIME I WOKE UP TODAY: 11:30 a.m. I've been super sick lately, sleeping a ton! MY DREAM VACATION WOULD BE: A couple free weeks in Italy! MY DREAM VACATION WOULD BE: Europe, being all the way in Aus, it's hard not to dream big! TIME I WOKE UP TODAY: 6:30! MY DREAM VACATION WOULD BE: since I've been dreaming of going back for about 10 years, it would have to be Hawaii! TEA OR COFFEE: Toughy. I LOVE ice tea but I have to have my cup of coffee every morning! TIME I WOKE UP TODAY: 6:03 a.m. FAVORITE GUILTY PLEASURE TV SHOW: Not sure on a tv show...I don't watch too much tv. MY DREAM VACATION WOULD BE: Either Sweden or somewhere tropical! FAVORITE GUILTY PLEASURE TV SHOW: whatever is on HBO on Sunday night. Right now, Game of Thrones. Great post. I love these kinds of little questionnaires! TEA OR COFFEE: Neither usually, but if I have to choose then tea. MY DREAM VACATION WOULD BE: Hawaii. I've never been and would love to make that my future honeymoon. TEA OR COFFEE: Tea for sure. Coffee gives me heart murmurs! TIME I WOKE UP TODAY: 9:00am... yeah I'm lazy. MY DREAM VACATION WOULD BE: Italy and Greece. I've been to Italy once, but I'd go back in a heart beat! FAVORITE GUILTY PLEASURE TV SHOW: AMAZING RACE! goal:to be on it one day! MY DREAM VACATION WOULD BE: EUROPE! I love it there! TEA OR COFFEE: Tea in the morning, tean in the afternoon during the week and coffee in the afternoon during the week-end ! TEA OR COFFEE: Tea, for sure. Always iced, sometimes hot. With a lemon. FAVORITE GUILTY PLEASURE TV SHOW: Design Star, although the show is the not really a guilty pleasure, the amount of time I spend watching each new season kind-of is, haha! MY DREAM VACATION WOULD BE: Oh, anywhere in Europe! TIME I WOKE UP TODAY: 7:30 am, because my hubby made me! MY DREAM VACATION WOULD BE: Somewhere very relaxing with a good book, lots of good food, and good antique stores! TIME I WOKE UP TODAY:8...I was so tired! Tea or coffee: Tea. Any and all! Guilty Pleasure TV: Real Housewives of the OC and Beverly Hills! TIME I WOKE UP TODAY: 6:45 a.m.
MY DREAM VACATION WOULD BE: Any beautiful beach with my hubby! TIME I WOKE UP TODAY: 4:45. This is what school does to me. MY DREAM VACATION WOULD BE: New York - I am DYING to visit! Ohhh this is pretty cool! MY DREAM VACATION WOULD BE: My Moroccan boyfriend's homeland, or maybe Alaska (a very different choice I know). Really anywhere else than Europe. Adventure ! What a fun way to get to know others. MY DREAM VACATION WOULD BE: to visit my fiance's family in Costa Rica & my family in Argentina & Peru. MY DREAM VACATION WOULD BE: This is too hard. Fiji or Greece would be up there for sure! TEA OR COFFEE: Tea because I'm an Anglophile and Chinese but I'll drink coffee when it's offered. TEA OR COFFEE: Bubble tea and black coffee, please! TIME I WOKE UP TODAY: 5:15. Eek. FAVORITE GUILTY PLEASURE TV SHOW: The Nanny. Definitely. MY DREAM VACATION WOULD BE: London! MY DREAM VACATION WOULD BE: Any where is white sand beaches and crystal clear waters! TEA OR COFFEE: both as long as it's piping hot! MY DREAM VACATION WOULD BE: s little getaway with my husband to anywhere without my kiddos! TEA OR COFFEE: Both, please! TIME I WOKE UP TODAY: 7am - I find it hard to sleep in even when I have the day off! FAVORITE GUILTY PLEASURE TV SHOW: One Tree Hill. Seriously, sick days spent in bed are best spent watching One Tree Hill. MY DREAM VACATION WOULD BE: A trek from Dublin, to London, to Rome, to Sydney, to L.A, to Rio. Basically, I want to see the world! MY DREAM VACATION WOULD BE: Toronto, Canada. TIME I WOKE UP TODAY: 6:30, yuck! MY DREAM VACATION WOULD BE:Greece, only 158 days until I go! MY DREAM VACATION WOULD BE: Indonesia to see my family! My mom goes every year but she never takes me. TEA OR COFFEE: Both! And I like both of them either hot or cold. But I like my tea with no sugar and my coffee with flavored creamer. TIME I WOKE UP TODAY: 6:30 I woke up the hubs. 8:00 the foster baby woke me up. FAVORITE GUILTY PLEASURE TV SHOW: Snapped! TEA OR COFFEE: Either one! TEA OR COFFEE: coffee and lots of it! FAVORITE GUILTY PLEASURE TV SHOW: Tori and Dean. I feel like Tori and I should be friends. MY DREAM VACATION WOULD BE: Paris! Maybe someday. TEA OR COFFEE: I like both, but I've been drinking more coffee lately. I drink water 90% of the time though. FAVORITE GUILTY PLEASURE TV SHOW: I don't watch tv very much anymore, but I guess it used to be America's Next Top Model a few years back. MY DREAM VACATION WOULD BE: I'm going to Thailand with my boyfriend for a whole month this year and it's going to be amazing. TIME I WOKE UP TODAY: 8:45. was planning on waking up earlier.. am definitely not a morning person! MY DREAM VACATION WOULD BE: gosh, that is hard.. so many places i want to see! right now would be New Zealand. FAVORITE GUILTY PLEASURE TV SHOW: 90210... I know it's awful, and every time there's really obvious product placement I cringe, but for some reason I CAN'T STOP WATCHING! TEA OR COFFEE: Green or fruit tea (hot) or soy coffee. FAVORITE GUILTY PLEASURE TV SHOW: Bones. TEA OR COFFEE: I can only handle Lattes right now since I'm pregnant. FAVORITE GUILTY PLEASURE TV SHOW: Real Housewives of Orange County. TEA OR COFFEE: Both. I live in Seattle, we like our caffeine. Time I woke up today: 7am...but didn't actually get out of bed until 7:30. My Dream Vacation would be: Italy...top to bottom, right to left, no time restraints...and of course money would be no object! TEA OR COFFEE: diet coke! MY DREAM VACATION WOULD BE: iceland in the summer when the sun never sets! MY DREAM VACATION WOULD BE: Right now I am daydreaming of Vegas or Disneyland so a combo trip would be great. TIME I WOKE UP TODAY: 10 am, but every night I go to bed at 3 am. MY DREAM VACATION WOULD BE: Some French or Italian small city field with flowers, narrow streets and friendly people! This is a cute idea :) Thanks for sharing it! DREAM VACAY: Food tour through India! What a great idea, I love reading everyone's answers. FAVORITE GUILTY PLEASURE TV SHOW: Once Upon a Time, I can't get enough! TEA OR COFFEE: both. i LOVE good coffee but i'm a tea junkie too! TIME I WOKE UP TODAY: 7.20 ... although it was supposed to be much earlier! MY DREAM VACATION WOULD BE: so many! but at the moment i'm really craving beach. TIME I WOKE UP TODAY: 5:45am. Ick. FAVORITE GUILTY PLEASURE TV SHOW: Mine's The Vampire Diaries too! MY DREAM VACATION WOULD BE: Wow, there are so many places I want to go, but I especially would like to go to Italy. The whole country enchants me. TEA OR COFFEE: tea, love it! TIME I WOKE UP TODAY: 7:45, my husband let me sleep in while he took care of our 4yo! FAVORITE GUILTY PLEASURE TV SHOW: Mad Men, Community, 30 Rock, Parks & Recreation! MY DREAM VACATION WOULD BE: Europe to see the Northern Lights, all the Scandinavian countries & France! What a great idea! I don't know if you'll ever have the time to answer all of these... but here's my addition to the pile! TIME I WOKE UP TODAY: 9:13 AM-- thanks to a sleepless night. MY DREAM VACATION WOULD BE: To take a repeat trip of Europe, starting in Vienna and training it all the way to the beaches of Barcelona, Spain. Can I just say you are just the sweetest thing! TEA OR COFFEE: both, all day everyday. TIME I WOKE UP TODAY: when the sun rose! too early! FAVORITE GUILTY PLEASURE TV SHOW: Anything cheesy, but mainly "Once Upon a Time"
MY DREAM VACATION WOULD BE: A tour of Europe. Venice, Rome, Paris, and London. TIME I WOKE UP TODAY: 8:30 p.m.
MY DREAM VACATION WOULD BE: I'm longing to go to Australia! TEA OR COFFEE: Both, but mostly coffee. TIME I WOKE UP TODAY: 7:15am (Early breakfast with the girlfriends). FAVORITE GUILTY PLEASURE TV SHOW: Downton Abbey. MY DREAM VACATION WOULD BE: Travelling through South America- I grew up in Mexico and spent last summer in Panama, so I would love to explore going further south! TEA OR COFFEE: tea!! yum! MY DREAM VACATION WOULD BE: Paris please! TIME I WOKE UP TODAY: 6:45. Never fun. FAVORITE GUILTY PLEASURE TV SHOW: Ultimate Cake Off! MY DREAM VACATION WOULD BE:The Maldives...hotel room is out on a dock over the water! FAVORITE GUILTY PLEASURE TV SHOW: grey's anatomy - not really guiltily, just LOVE it! MY DREAM VACATION WOULD BE: europe - rome, vienna, paris. TEA OR COFFEE: strawberry, hot. lemon, cold. MY DREAM VACATION WOULD BE: some weeks in Paris with my best friends! FAVORITE GUILTY PLEASURE TV SHOW: The Real Housewives of...anywhere! Time I woke up today: 6:30. My baby was up an hour earlier than usual, ugh. TEA OR COFFEE: Coffee! with cream and splenda! aka sweet! FAVORITE GUILTY PLEASURE TV SHOW: Real Housewives! MY DREAM VACATION WOULD BE: Paris! I have to get there someday! FAVORITE GUILTY PLEASURE TV SHOW: Modern Family. Love it! It seems you have a lot of blogs to check out haha. TEA OR COFFEE: Either; both. TIME I WOKE UP TODAY: 11-ish. FAVORITE GUILTY PLEASURE TV SHOW: Pretty much anything on E! or Bravo. MY DREAM VACATION WOULD BE: Iceland. MY DREAM VACATION WOULD BE:Costa Rica. TIME I WOKE UP TODAY: 8:30am, I had the morning off! Hooray. FAVORITE GUILTY PLEASURE TV SHOW: Any ABC Family show and Dance Moms. It's pretty horribly amazing! MY DREAM VACATION WOULD BE: Tour of Greece to Morocco! Dream come true! FAVORITE GUILTY PLEASURE TV SHOW: Pretty little liars, i'm just scotch on it to know, who's that mysterious buddie. TEA OR COFFEE: neither - I always burn my tongue! TIME I WOKE UP TODAY: a very reluctant 6.30! MY DREAM VACATION WOULD BE: oh tough to choose just one... I think probably Hawaii or a Grand Tour of Europe! TEA OR COFFEE: too much coffee! MY DREAM VACATION WOULD BE: Greece! All of it. TIME I WOKE UP TODAY: six a.m. FAVORITE GUILTY PLEASURE TV SHOW: Jersey Shore! MY DREAM VACATION WOULD BE: Brazil! This is quite an idea. TEA OR COFFEE: love both, hot and cold. FAVORITE GUILTY PLEASURE TV SHOW: Supernatural, although i don't feel embarrassed about it, it's really entertaining. MY DREAM VACATION WOULD BE: Anywhere with my guy and our little one, but if the little would have something to say about it he would pick iceland and i'm down with that. TIME I WOKE UP TODAY: 7:45am. GROAN. Way earlier than my usual time. MY DREAM VACATION WOULD BE: Taking my husband to Krakow, Poland making a few other European stops along the way. FAVORITE GUILTY PLEASURE TV SHOW: Hum. HGTV Design Star? My dream vacay: The UK. Lots of family there. Never been. MY DREAM VACATION WOULD BE: I'm moving to Taiwan this summer so looking into places on that side of the world, but I've always wanted to see the pyramids in Egypt! TIME I WOKE UP TODAY: 8:00, but I have been tired upon waking up for about a week not. FAVORITE GUILTY PLEASURE TV SHOW: We don't have channels. MY DREAM VACATION WOULD BE: Anywhere overseas with the husband. We haven't been out of the country together yet! TIME I WOKE UP TODAY: 8:19 am. Kept hitting my snooze button. MY DREAM VACATION WOULD BE: Hawaii, all expenses paid, seeing all of the islands, relaxing and spending time with friends. Tea or Coffee: Coffee, about half a pot a day! My dream vacation would be: St. Lucia,and Island, spending time with my family. I have never been on a plane or out of the country! TIME I WOKE UP TODAY: 7am but I wish it would have been 9. FAVORITE GUILTY PLEASURE TV SHOW: Ha! Smash or Grimm, are those equally embarrassing? MY DREAM VACATION WOULD BE: Tuscany, I imagine lots of walks to nowhere and great food. TIME I WOKE UP TODAY: 6:30, but then I hit the snooze until 7 and was almost late for work - whoops! MY DREAM VACATION WOULD BE: a summer trip around Europe, hitting the Scandinavian countries and working my way south to Italy, then over to Greece and Prague. TEA OR COFFEE: neither. i'm a water/fruit juice kind of girl. TIME I WOKE UP TODAY: 6:45? it's been a long day. FAVORITE GUILTY PLEASURE TV SHOW: teen mom/16 and pregnant. MY DREAM VACATION WOULD BE: a cross-country road trip + ending it in Hawaii. I love that I can get to know some of the other bloggers who love this blog, too!